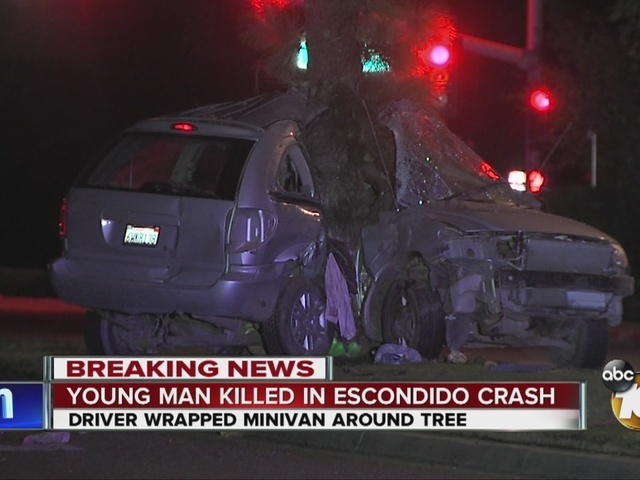 A 21-year-old driver was killed when his speeding minivan struck a tree off an Escondido roadway with such force it nearly split the vehicle in two Monday night, police said. The man, identified as Galileo Esteban Diego, lost control of his 2006 Dodge Caravan while headed west on Country Club Lane at a high rate of speed around 7:30 p.m. Monday, according to an Escondido police statement. The minivan careened into a tree in the center median just west of Broadway. "The vehicle impacted a tree with enough force that it was nearly torn in half," police said in the statement. The driver died at the scene and his name has yet to be released. Police said speed was a major factor in the crash, but it was unknown if alcohol was also involved. Anyone with additional information on the crash was asked to call a police traffic investigator at 760- 839-4407.